One of the more unusual and most productive Derby-Shelton Rotary Club grants was one made to the Shelton Economic Development Commission that eventually helped the cities of Derby and Shelton earn a $265,000 grant to study improvements to the historic Derby-Shelton bridge which links the two communities together. The SEDC was interested in improving the look and functionality of the bridge which serves as a gateway to those entering the two cities while crossing over the Housatonic River. The Derby-Shelton Bridge crosses over the Housatonic River and connects the cities of Derby and Shelton. It links Route 34 in downtown Derby with Route 110 in downtown Shelton. The current bridge was built in 1918 by the Connecticut State Highway Department to replace a former steel-arch bridge built in 1891 known as the Huntington Bridge. Prior to that, an even older wooden covered bridge (built in 1857) was at this site. The Derby-Shelton Bridge used to carry two street railway tracks until the 1930s. The SEDC used the study conducted by Tate and Associates to receive a $265,000 grant from the CT Department of Transportation and Office of Policy and Management to create a design for the eventual rehabilitation of the bridge. The design will include bike paths, walking paths and new lighting and railings. The bridge will be designed to move pedestrians and bicyclists through Derby and Shelton’s downtown freely and through attractive walkable paths. Bridge enhancements will help make it easier for residents and visitors to connect to downtowns and the Derby Shelton Train Station. “I am pleased to work with Mayor Lauretti in bringing this project to our cities and towns. It shows what can be accomplished when communities work together to enhance their infrastructure.” Said Mayor Staffieri. 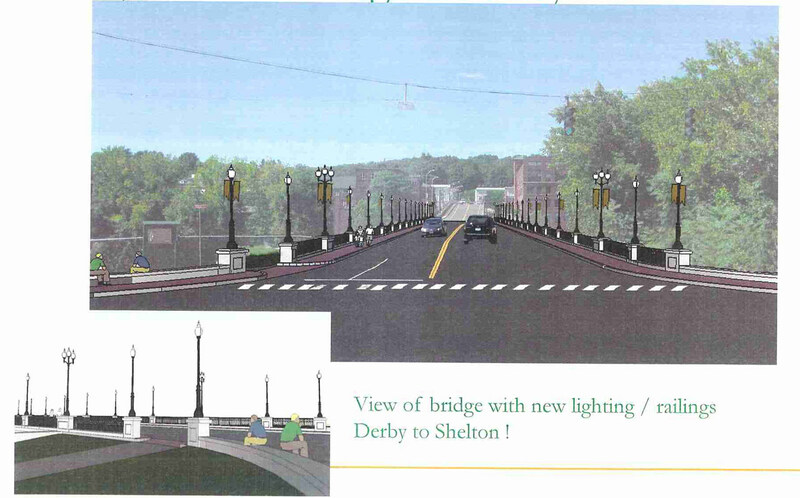 “The bridge between downtown Derby and Shelton will be getting a face lift, part to make it more friendly for bicycles and pedestrians. The state bonding commission authorized $2 million for the project, according to a press release from House Republican leader Themis Klarides, state Rep. Jason Perillo and state Rep. Ben McGorty. Klarides represents Derby, Perillo and McGorty represent Shelton. The $2 million grant goes to the Naugatuck Valley Council of Governments and will go toward resurfacing the bridge, installing new lights, along with the addition of bicycle and pedestrian improvements. The bridge spans the Housatonic River, connecting Route 34/Main Street in Derby to Howe Avenue /Route 110 in Shelton. On the Derby side of the bridge, the city is waiting for the state to start the long-anticipated Route 34 widening project. “By creating greater accessibility on this bridge for foot and bike traffic we are expanding access to our local shops and restaurants. Having a viable conduit between the two of them will vastly improve economic development in both towns,” according to a statement from McGorty. The bridge rehab, plus an improved Route 34, will (hopefully) make it easier to bike or walk to the Metro-North train station in Derby. The bridge was built in 1918 and has been looking its age, especially in contract to the residential development that has taken over the river front in downtown Shelton. “This work will help restore the bridge to its original historic feel and will complement in-process redevelopment efforts in Shelton,” Perillo said in a prepared statement. Perillo’s statement went on to thank Rick Dunne, executive director of the Naugatuck Valley Council of Governments and Jim Ryan, president of the Shelton Economic Development Corporation for their assistance with the project. Work is unlikely to begin in 2017 because of an additional project that is reshaping Rt. 34 (Main Street) in Derby which will need to be completed before the bridge work can be done.